Twenty years ago, Mary and I got our first real home computer (the Commodore 64 didn’t quite count). With an Intel 486 processor, 500k of ram, an 8k external modem, and AOL memberships, we were wired! Full-fleged members of the information age, at least by the standards of the day. In Snowcrash, Stepenson posits a world where nation states have transferred most of their power to corporations. Most people are corporate citizens and live in corporate enclaves, or less prestigious burbclaves. The hero of Snowcrash, Hiro Protagonist, is a citizen of “Mr. Lee’s Greater Hong Kong.” Military power belongs to private contractors, as do the roadways, which vie for driver/customers. The post office is gone; private couriers deliver snail-mail. The United States occupies a smallish territory centered in the Mohave Desert, and keeps it’s employees busy with make-work projects. The former United States economy hinges on two industries – computer microcode and high speed pizza delivery, which has been revolutionized since the Mafia took control. Though Hiro is a citizen of Hong Kong, as a pizza driver, he can’t afford to live in their enclaveclave. Home is a self-storage unit under the flight path at LAX. Like most of his hip and cyber-savvy generation, he spends most of his time online in the guise of his avatar, navigating virtual worlds. But something is happening in the online world. A strange new computer virus, when opened, generates a graphic pattern that scrambles the brains of the user. They are dazed and speak in tongues. With a young woman named YT, for Yours Truly, Hiro sets out to unravel the mystery. The villain turns out to be a charismatic preacher. In his attempt to secure both temporal and spiritual power, he has tapped into the ancient Sumerian glyphs that first scrambled human speech patterns in the event known as the Tower of Babel. It’s been 20 years since I’ve read Snow Crash, so I’m writing this from memory. I’m not necessarily recommending the whole novel. The first jaw-dropping 100 pages, where Stephenson built his world, flew by and still leave me in awe. I remember the rest of the book dragging in parts, but I still think of the story all the time. Most futuristic fantasies prove as silly as the 1930’s movie shorts that show humans zipping along in their air cars between high rise buildings, happy and without any accidents. This book is different. In 1992 there were no virtual worlds. Now there are, and you have to create an avatar to negotiate them. These days, it isn’t so hard now to imagine a bright young man living in a self-storage shed. But above all, Snow Crash comes to mind because in the wake of “citizens united,” it’s so easy to see corporate power growing while government power wanes. With Super Pac money rolling the election year dice, does the government control corporations or do corporations control government? Neal Stephenson saw this and other aspects of our world coming 20 years ago. 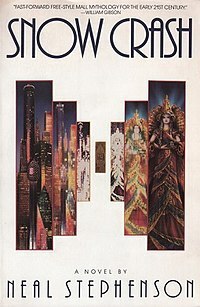 Snow Crash, is a visionary novel that all lovers of fantasy should know. This entry was posted in Authors, Book Reviews, Books, Characters, Culture, Fantasy, Novels and tagged authors, book reviews, books, Culture, ebooks, fantasy, fiction, fictional characters, Novels, writing. Bookmark the permalink. I’m always astonished by alternate-universe novels and the world building that occurs. I don’t know how writers do that. My head just doesn’t work that way. I continue to be amazed by the world you built in your novel and hope I get to see more of it some day soon. I don’t know if I’ll read Snow Crash, but it’s interesting to know about it. By the way, a little more than twenty years ago, my husband talked about a new company starting down the street from where he worked. He told me it was called Apple and they intended to make sure every home had a computer. I looked at him as if he’d lost his mind and asked why anyone would need a computer in his house. Like I said — a visionary, I am not! In my mind, alternate worlds have differing degrees of difficulty. Internal consistency is required, but beyond that, outer space as well as sword-and-sorcery realms are easier than what Stephenson accomplished. So many “alternate futures” would just seem silly after 20 years! The company where I worked had a prototype mp3 player, but abandoned it after one of the top execs decided it had no future. The iPod came out about a year later.